Added new tweaks including Windows 10 only tweaks and desktop icons; rearranged Tweaks tabs. Added dSupportSuite Install/Set User Details to End Session tab. dSupportSuite installation process now creates desktop/start menu shortcuts that obey the custom application icon and the custom application name for dSupportSuite, if configured. Added tweaks: Disable Install of Suggested Apps, and Disable Ads and Suggested Apps in Windows 10. Added ‘Block Program’ and ‘Block Program from Internet Only’ to right click options in KillEmAll results windows. Fixed bug: System with no Anti-Virus installed wasn’t triggering red/alert status on System Info tab. Added tweaks: force classic control panel, power plan options, show all icons in system tray, toggle ‘People’ on taskbar in Win10, disable startup app delay on Win10, and option to enable/disable Storage Sense on Win10. Previously when a client name was entered on the Session Start prompt, this replaced the computer name in the information/work report header. Now both client name and computer name will appear in report headers. Fixed settings on End Session tab not saving until you close d7x normally, despite pressing the Save Settings button; this bug caused a subsequent config upload to the Config Mgmt Portal to have these settings unsaved. Additionally the End Session tab’s close and delete option never saved as a setting before, now it does. A lot of d7x functionality wasn’t logging in the work report; fixed. On the Reports tab left column, the Web browser passwords, Mail passwords, and Wireless key reports now save to file automatically. All Nirsoft and Sysinternals utilities used by d7x internal functionality now save to either the Nirsoft or Sysinternals folder under 3rd Party Tools. Fixed Test button not firing when creating a new custom app. Added Steve Gibson/GRC’s DNS Benchmark utility. The d7x v19.3.2 Release adds an important new feature for Windows 10 and Microsoft accounts. During any restart to Safe Mode initiated through d7x, it will now automatically create a temporary admin user IF the current user account is a Microsoft (online) account. The temporary admin user named “d7x_TempAdmin” contains no password for login, and will be deleted automatically during End Session. If you are logged in to that user account during End Session, you will be prompted to End Session again from another user account, and then you will be logged out. This feature was added because typically a Microsoft account password will NOT allow login to that user account in Safe Mode. For one thing, if you can’t login to Safe Mode then there was no point in rebooting to Safe Mode, but there is another good reason to do this. Because d7x modifies the BCD to automatically start in Safe Mode, it must run in Safe Mode again to undo the modifications, which it normally does automatically; but it cannot run if a user does not login to Safe Mode, and this would trap the PC in a Safe Mode loop. A second new feature tied to the same reasoning will prompt you to create this same temporary user if on the Session Start prompt you select to AutoLogin a user to Windows and the selected user account is a Microsoft account. This is recommended not only in case you need to boot to Safe Mode, but also in case you use the wrong password for a Microsoft account, which if you did you would then be stuck in a logon/logoff loop. Fixes: From last release, existing custom apps were not saving changes. Additions: Malware Search Tool whitelist definitions (once an optional download from the website) are now automatically downloaded, and used in addition to any existing definitions you may have. They are also converted to a newer format with less than half the file size. Fixed user created custom apps not deleting from Config > Custom Apps tab. Improvements to Windows Update repairs for all versions of Windows including 10. Improvements to many other repairs for Windows 10 (specifically) including safe mode services, networking/winsock, defender/firewall, file associations, and more. Fixed an issue where changing configs in Config Mgmt Portal to an older d7II based config did not overwrite all existing config settings even after restarting d7x. New backup download routines will solve an issue with downloading ADWCleaner. Windows Update link (Internet Menu) now properly opens Windows Update on Windows 10. Implemented new config file formats allowing for easy expansion of new settings. All user-created custom apps will be converted to the new formats automatically. Your existing downloaded custom apps WILL RE-DOWNLOAD to new locations with this update! Implemented new interface for configuring custom apps, which may be slightly more overwhelming, but is organized better and far more descriptive. This update corrects an issue with the previous update and running an older d7x config from the d7xRDT. d7x v19.2.20 was not waiting to convert user-created custom apps which were not yet downloaded from an older d7x config by the d7xRDT, and therefore only default custom apps were present when d7xRDT was used with an older d7x config. This v19.2.21 update corrects that issue. Corrects an issue with user created custom apps not being configured properly in the conversion process with respect to the download location of the custom app. New custom event logs are viewable for Windows 8.x/10; several are pre-defined, or put in the log name/location for anything not present. New custom logs can also be erased! Event filters and custom event logs are saved as they are used, so that the data will persist in a drop down selection box for future usage. Fixed top status sliding over for long rectangle logo when rectangle logo was not configured. The “Info Report (No Passwords)” option on the Reports tab was leaving original Nirsoft output files containing passwords, even though they were filtered from the “Info Report.html” therefore the original files “Mail.txt” and “WirelessKeys.txt” will now be deleted when using the “(No Passwords)” option. Added descriptions to internal functionality on the “d7x Tools” tab. DataGrab now backs up Chrome Canary, Chromium, Dragon, and Opera (Stable, Beta/Next, and Developer) user profiles in addition to standard Chrome. DataGrab previously deleted Chrome cache and then backed up the entire profile dir; this was slow and unnecessary; currently only files in the main Chrome user profile directory are backed up since that contains settings, favorites, history, etc. and nothing in the subdirs (e.g. cache) is useful. Added support for Opera (Chromium based), Opera Beta, and Opera Developer versions to the already supported Chromium including Chrome, Chrome Canary, and Dragon Chromium variants. Improved delete routines with respect to multiple browser/user specific profiles in all Chromium variants as well as Firefox. Fixed right-click and delete option was either not deleting at all or not deleting the selected file/dir. Fixed LNK Target field not populating in search results. Fixed all files option stubbornly and silently reverting to default file extensions when using the custom file search prompt. Added .lnk (shortcuts) to default file extensions in Desktops, Start Menus, and Startup Folders searches. Began documenting Malware Search Tool behavior on this page in the manual. Don’t forget to check out the previous build’s release notes from a few days ago if you haven’t already, including a video! d7x can now use a 3rd party tools path from a network path when starting a new session from that network path; just select “No“ (now the default response) from the prompt to use a local 3rd party tools path. DataGrab options including wildcard entries and additional folders to backup will now save automatically and persist along with your d7x config. Re-implemented internal FTP client for self-hosted servers, now including optional SSL/TLS/AuthTLS security settings. Clarified in the UI that the exclude files option was not for Vista+ only, and also applied to WinXP backups. Fixed Take Ownership/Permissions right click context menu item. d7xRDT fix with added support for 2 additional servers in case of a primary server outage. Recreation of the d7xRDT, also at v18.12.20, is necessary to take advantage of the added servers. See this post for more details if necessary. Added confirmation prompt to menu setting to disable/enable User Account Control. Most config settings moved over to new d7x format. From the session start prompt, the auto-login users list now excludes standard user (non-admin) accounts entirely from the list of users to select. You can still type in a standard username and d7x will prompt you to promote the account to the Administrators group. Previously auto-login (if attempted on a standard user account) did not display a warning message (nor the prompt to promote account to the Administrators group) and cancelled the operation without warning. Now standard users only show up in the Users drop down menu/dialog for auto-login, and if you attempt to set auto-login for a standard user you will be prompted to promote that user to the Administrators group. Lock screen was unlocking for everything BUT the tech password. Load Profile setting wasn’t populating in Config. Renamed user accounts would display in some areas of d7x as the old username, not the new one. This did affect Auto-Login functionality. You can no longer bypass the Technician Password prompt (during initial setup) without creating a password. Corrected an extended time/freeze and excessive RAM usage while creating a screen shot. When using d7xRDT with a newer license type, d7x no longer fails to recognize the license after download. This release adds additional checks to a fix from last release. A few instructions/info in Config were corrected. Corrected an issue retrieving new license formats (for purchases since Oct 2018) from d7xRDT, which forced users to enter the account credentials on deployment/startup. Please note: Although the error is corrected for newer license files, affected users may need to recreate your d7xRDT with this newest release in order to avoid being forced to enter in the Technician Password during deployment. Added Windows automatic update override settings to d7x Config interface. Changed some app logos to static filenames. You can now configure d7x to start on the d7x Tools tab, bypassing the System Info tab and some startup checks. Starting d7x while holding down the SHIFT key will run KillEmAll automatically killing all non-essential processes. Replaced “Run Program” functionality (from the Run Menu) with a new dialog containing more options, including command line argument usage. Now there should only be one (or two at most) ‘Examine File’ windows open, with new tabs populating for each subsequent file to examine. Note that two windows will be opened if the first ‘Examine File’ was called from an instance of d7x running under the local system account, then a subsequent call opens the dialog from a d7x instance running in user mode. Starting in System/Service modes from the startup prompt no longer triggers the incomplete startup flag on relaunch. Fixed KillEmAll showing results/report in invisible Notepad window. Fixed Tools menu not populating. Fixed an issue causing some apps started under the local system account (or d7x itself) to start invisible. Fixed startup tab selection when changed to anything but the System Info tab in config. Updated or removed several broken links from the Internet drop down menu. Fixed CPU Priority settings not saving anything but ‘Normal’ in Config > Startup Behavior. Fixed CPU Priority settings not functional in the Main menu. d7x scheduling on a tech PC now uses d7x.cmd to avoid filename issues with updates. Added more descriptive info to various config items and moved a few options to where they make more sense. double clicking a plain text report on the reports tab was opening notepad in a hidden window. session activity and alerts were not being displayed for the custom report builder. zero byte files no longer displayed as matching malware hashes in Malware Search Tool. srvany.exe not copied properly when running d7x Locksmith on a Windows XP system causing functionality to fail. added manual tools log output (Malware Search Tool, Examine File prompt) to custom work report builder. double clicking a file in Malware Search Tool now brings up the Examine File prompt. \Modules dir has been moved to \d7x Resources and some unused modules were removed. IFEO Modifier now has description and how-to/usage scenario information. Improved Windows Update repairs for Windows 10 specific issues. d7x Event Log Viewer adds ‘Last Week’ and ‘Last Month’ to the event filtering in addition to the existing ‘Last Reboot’ option. Added PowerCfg Efficiency Diagnostics report to reports column on the Audit/Diag tab. Previously this was buried in the tweaks section under the PowerCfg wrapper. Fixed ‘Non-Direct URLs’ method for downloading custom apps which scrapes a downloaded web page for the current download link in a redirect; this is used in conjunction with the updated CCleaner default custom app released yesterday with other default apps fixes. Fixed issue with incorrect icons being used for the d7x Tools tab, which was randomly pulling icons from other apps. Custom icon (e.g. applogo.ico) now displays properly in the top left corner of app windows. The last few builds were overriding a customized icon with the d7x logo. Resizing the window now functions as expected. The tab order (keyboard tab) has been arranged to navigate the options/buttons as expected. Updated Malwarebytes and Emsisoft a2cmd profiles, added a Malwarebytes (Uninstall) profile. Minor fix to custom apps execution involving functionality found in Emsisoft a2cmd config profile. d7, d7II, and d7x have been built with future proofing in mind for their usage of CleanMgr.exe, and therefore all previous versions will automatically enable the “Downloads” option for deletion when running as an internal function. Since it is all automatic, running this functionality will delete all of your customer’s downloads! d7x v18.10.11.0 has been released today in order to DISABLE the deletion of “Downloads” when using it’s CleanMgr.exe functionality. This update is pushed automatically to all release build versions of d7x. Edit: for clarity, the d7x CleanMgr functionality also always skips (de-selects) the Recycle Bin, memory dumps (since they are small and so you can analyze them of course), MS Office temp files (installation/cab files which are sometimes necessary), and the file compression options. v18.10.6 - dSupportSuite client software now included with d7x! Additions: The dSupportSuite client software, the digital calling card with a purpose, is now included with d7x! This video introduces you to the dSupportSuite client interface within d7x allowing you to install and configure it on your customers’ PCs. For actual dSupportSuite configuration please see our dSupportSuite Client Software Overview and Configuration video; in the video notes you will find links to specific sections of the configuration. Added new DISM.EXE commands to cleanup WinSxS and other areas to the d7x Delete Windows Update Backups function. Added additional cleanup to d7x Delete Windows Update Temp function. Added d7x Delete Windows Logs function (below) primarily to cleanup over-sized logs in %windir%\Logs\CBS and a few other locations. Fixed an issue where Single Pay licensing did not prevent d7x from updating beyond the licensed version maximum. Fixed d7x not restarting after downloading config with d7xRDT. MSI files were not launching when configured in custom apps. The end session “Close and Password Protect” and “Close and Delete…” options were switched. Fixes: Windows activation check ran twice at session start if configured to generate an info report at session start, and failed to determine when not activated on some Windows 10 systems. Changes: The main d7x user interface is now re-sizable, and is slightly smaller by default (to fit a 800×600 resolution, which it is still only slightly larger than this in width.) A more minor change is that it also has added the same slight gradient background as the new KillEmAll interface. The smaller interface now serves to replace the d7x “safe mode” interface which was smaller and re-sizable as well. Consolidating both (separate) user interfaces into one will allow for faster and more consistent development as this single user interface is updated with d7x code and altered graphically as time progresses. Because the d7x “safe mode” user interface also had the advantage of being lighter/faster due to removing the “System Info” tab and startup checks (some involving WMI which can slow down startup) “safe mode” functionality persists as an option in this update, and will not be removed, although the actual separate interface itself was removed. The functionality now uses the main d7x interface but maintains the ability to skip startup checks from the “System Info” tab, which is also hidden from the user in this mode. The custom logo and top info from the main interface remains however, but the status info is not functional (see pic) and currently the option to switch back to d7x “normal mode” is no longer a button, but is now under the same menu item as is getting to “safe mode” (see pic.) Some of the non-functional top info will be added (likely the OS info and all that is covered in the pic below) but NOT the RAM utilization and the CPU/PageFile which are normally updated in intervals of seconds. d7x.cmd (During a previous update I believe this went unmentioned.) Under Check for d7x Updates in d7x Config, a new button “Create d7x.cmd” exists which creates a batch file in the same directory as your “d7x vX.X.X.X.exe” file. This batch file can be used to consistently start d7x with the same filename, for anyone scripting launch of d7x in some way. During any update, when this batch file (of this name) is detected, d7x will update the batch file to start the new “d7x vX.X.X.X.exe” filename, therefore you won’t need to change a thing. Added all options from Work With File (except blacklist functionality) to the Examine Target shell extension installed by d7x (optional) including automatic signature checking on the examined file, checking hashes against the current blacklists if used (used/updated via Malware Search Tool 3000 and stored with your own definition files) as well as automatic VirusTotal.com queries for existing hashes and manual queries for items not already hashed by VirusTotal utilizing Sysinternals Sigcheck.exe (subject to it’s query limit/4 per minute limitations.) See pics. The new option for “Start Program with Windows” will prompt to add the program to either the Windows registry’s HKLM “Run” key, or the second (new) option is to add to the “RunOnce” key instead. Of course the “RunOnce” key runs the program once and removes the entry for subsequent restarts, however you may not know that “RunOnce” also launches programs in an administrator context and BEFORE Windows Explorer (explorer.exe) and many other user login related tasks, waiting for the program to terminate prior to loading Windows Explorer as the shell. FTP functions requiring the creation of /Nested/Paths/More than one/Level/Deep were failing. This was notable with reports uploading functionality (entire dir, not zip) which was not creating all of the appropriate nested paths based on your settings from the Reports tab, and when failing to create the paths all reports were uploaded to the FTP root dir. Fixed. Debug submission upload to the server was failing (this did not affect the email submission); this was actually fixed in v18.9.1.0 last week. New menu options/functionality added to the dialog used by KillEmAll to examine individual files. This dialog should also be added to Malware Search Tool 3000 in the next few releases. The same dialog mentioned above was also added as the new “Examine Target” right-click context menu in Explorer, which when completed with all functionality will replace the older “Work with File/Dir” option that appears in the context menus. Report storage format backslashes were creating failures when using “Move reports to FTP server” and not zipping reports, due to a double path/forwardslash was being created when a trailing backslash was used in the Config > Reports > Remote storage format variable syntax. Full Auto Mode was re-running all reporting options in the left column of the Audit tab after every reboot. Full Auto Mode was reporting that it wasn’t completed, even when it was, if you started it a second time. The Reboot (Force) internal d7x functionality had two issues: First, it prompted the user to reboot with a Yes/No dialog during Auto Mode when it should have just rebooted without prompt. Second, after the reboot d7x failed to restart itself automatically in order to resume Auto Mode. Old report directories/zipped files are no longer uploaded, only the current report directory (zipped or not) will be uploaded to FTP server. 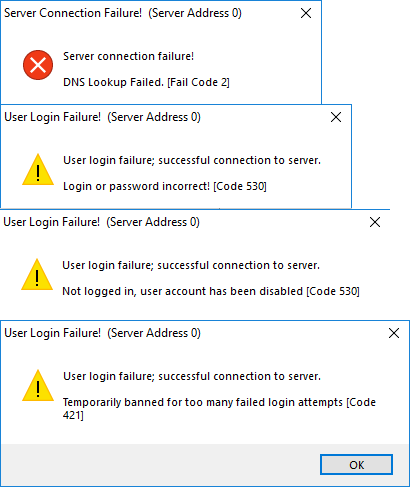 Added specific error messages on connection/login failures to Config Mgmt Portal and in several other operations that communicate with our servers (for example the “Invalid Credentials” message can alert you, so you don’t get the “IP banned; too many invalid login attempts! Please contact support…” message!) These specific error messages were introduced a few builds prior, but were available only when registering the app for the first time, causing things like running from the d7xRDT to display more generic errors. The d7x “Safe Mode” window was missing options for Malware Search Tool and dUninstaller which appeared in the main interface, causing other items in the “Safe Mode” UI to perform different behaviors. Today was a minor update which should hopefully resolve some uncommon behavior where a few people reported not being able to save FTP config settings for self-hosted usage, specifically the settings were wiped when shutting down/restarting d7x. Additionally the Malware Search Tool and it’s definitions update check still reported defs from 2016 were current, despite the recent update on August 8th, 2018. This occurred unless you deleted an older d7II_Updates.ini file from the .\Modules directory. The tool still relied on d7II update information which is not being downloaded/updated through d7x when the info file already exists. This behavior has been fixed and it should now rely on the d7x update information, which is updated at least at the start of every new session. Note that even after this update, if you perform an update check through the Malware Search Tool prior to the d7x updates information has been refreshed, it will download the latest definitions yet display a current date of [ ] nothing when it reports the successful update (this is expected.) Also worthy of note is that the “Check for updates” in the Malware Search Tool does not perform or force a full d7x update check, and relies on the existing d7x update behavior. 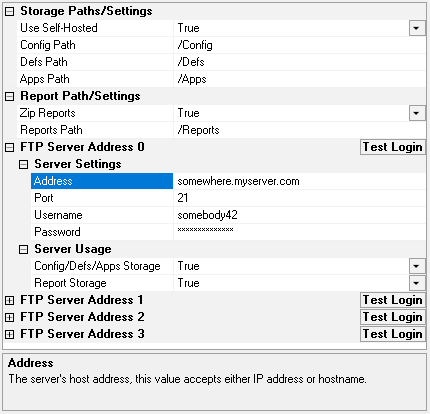 New FTP setting “AutoFix” to ensure standard server settings/ports when using SSL. Be sure to disable if using non-standard ports, especially with Implicit or Explicit SSL. Newer d7x based FTP code has replaced ALL d7II based FTP code, even for non-SSL connections. Reports uploading and related functionality is rewritten and 100% d7x code. This fixed a bug where d7x (and d7II) were not uploading previous session reports from the same PC, but only uploaded the current session’s reports. Fixed a bug from this weekend’s release where d7x did not think it was properly connected to dCloud, causing functionality failure in Config Mgmt Portal. Note this weekend’s issue did not affect Self-Hosted configurations. Fix: Fonts that formerly displayed in bold (e.g. in the alerts column of the System Info tab) are now properly displaying as bold where they should be. Fix: Although new license purchases were not affected, the previous version did not allow existing d7II based license holders to register a new copy/download of the software without an existing Reg.Settings.dat file from a previously registered copy of d7x or d7II; this has now been resolved. Fix: Definitions Merge/Download update checks now use the exact server time for file data comparison (this was previously calculated at upload from the local time, which occasionally caused a minute difference, or consistently a minute or two difference with large definition sets, and this triggered the update/merge prompt on startup or session start when it really shouldn’t have. Not so new: “dFunk/MalwareScan” underwent it’s third incarnation and has been adopted into the main d7x code base and binary, and is now called “Malware Search Tool 3000” (it will replace your existing customizations for the former names, and is also available via the ‘Main’ drop down menu.) We’re trying to find a name more compatible with what it actually does, rather than something weird or misleading. Suggestions are welcome, but please try to avoid names sounding similar to other apps. It may not stick since we had also considered integrating the interface into KillEmAll and dUninstaller, but this may or may not materialize. What comes next is finishing the move to d7x code for FTP reports storage, which will allow us to enable the new SSL/AuthTLS functionality for FTP, which is already a functional piece of the d7x code platform. Look for that soon! d7x will update itself on next launch, and as always you can download manually from the d7x Manual. FTP/Email settings are no longer saved in d7II format due to new features, but d7x will still import d7II legacy configurations. The Technician Password prompt (used with various functionality) now accepts your d7x Subscriber Account password. NOTE this cannot be used for extracting configs from the Config Mgmt Portal (or d7xRDT) when encrypted with the technician password. When you specify an incorrect Technician Password for configs downloaded from Config Mgmt Portal (or d7xRDT) you are prompted as such and given the opportunity to try extraction with a new password. The above feature of prompting for password extraction now applies to all compressed archives provided that Auto Mode is not in process. NOTE that actual support for password protected archives will be added to the custom apps system at a later time; at this time your tech and account passwords will be tried should any existing archive fail to extract with a password error. The Dirty Volume check has been bypassed when forcing a reboot from within d7x. Fixed system restore reporting disabled when it wasn’t. Fixed prompt that (when enabled) showed that new definitions were found on the server when no defs were ever uploaded. 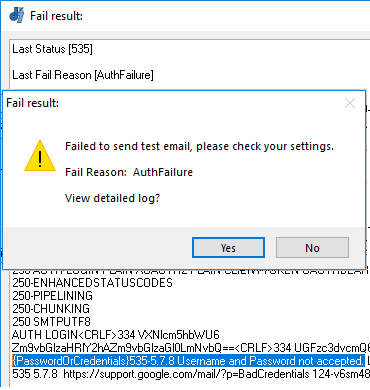 New Email and FTP connection error messages are detailed, no more guessing when testing a config… Additionally the Email failures offer a full log option. See pics below! This release fixes an Email failure in SMTP configurations that use either the “No Encryption” or the “SSL only” option. Those using TLS via the “SSL/TLS” or “StartTLS” SMTP settings were not affected by this issue. Also fixed this release is the “Send Test Email” button in d7x Config which always returned a successful result, even if it failed to send. Today’s release adds only one notable improvement to the custom apps download capabilities, which facilitates the download of AdwCleaner using the improved non-direct URL option. This was necessary when updating the custom apps package for this default app, as well as the Auslogics DD Portable which also needed a newer download URL. The default custom app profiles are updated automatically and without notification. Please Note: v18.5.7.1 is NOT a ‘FastTrack’ build as it will be detected by previous versions, rather this version is actually a ‘Release’ build (which also fixes the bug in prior versions causing this issue.) For this reason, the only update notification will come as an optional prompt when manually checking for updates (which will incorrectly inform you it is a ‘FastTrack’ build.) Please update to this build in order to resolve the issue with FastTrack/Release build detections! Fixed an issue where d7x failed to start with the “System Mode” d7x Startup configured (d7x Config > Behavior tab > Startup Behavior) when d7x was started without all of it’s resources already downloaded, which is always the case when deployed remotely via d7xRDT. One of the d7x Resources (d7xSvcWait.exe) is required for this mode to function properly. Side Effects: The next normal launch of d7x (non-system mode) on that PC would determine that a temporary d7x service was installed, and at this point it will be removed by choosing the “Abort” button. See pic. FYI: A good work-around that would’ve worked in this case to start d7x in normal (non-system) mode is to force the d7x startup prompt. Do this by holding down the CTRL key while starting d7x (a great time to do this is after clicking OK on the UAC prompt that fires when you launch d7x), and then choose the “Normal Startup” option which would bypass the pre-configured “System Mode” option causing the failure. IMPORTANT: If you haven’t read yet, d7x v18.2.3.0 and all previous versions will no longer self-update or recognize update availability. Please see this post for more information including specific update instructions (copy the latest “d7x vx.x.x.x.exe” file into your d7x folder, delete the old version, and re-create your d7xRDT if one was used.) Please accept a sincere apology for any inconvenience this may cause. Lock Screen: Added prompt to verify that the tech knows the Technician Password before allowing the lock screen to be enabled. This prompt will occur ONLY ONCE per session, and does NOT apply to the new custom Lock Screen option above when run during Auto Mode. Config UI: Improved search option on Custom Apps tab to include item descriptions for d7x internal functionality. Updated search engines: (Config -> Browser/Search tab) Removed Scroogle (no longer in operation) and Dogpile (which at one time was worthy but no longer.) Added Duckduckgo and Bing (for some reason…) Separated Google searches to specific English, Encrypted, and English/Encrypted options. Mail Password Functionality: Restored functionality utilizing Nirsoft MailPV.exe for mail password gathering functionality. This was previously disabled when Nir updated the app to remove command line arguments, unless you had below a certain version of that .exe still in your .\3rd Party Tools directory. Since then Nir has released new versions that re-enable command line arguments, but they must be downloaded from a password restricted area; d7x has been updated to download the new MailPV.exe from that area so it can once again function as previously expected. New password protected download functionality was implemented for this feature, and although this is not yet available as a configurable option for other custom apps, expect that to be added to the custom apps configuration interface in a near future update. d7x and d7xRDT Crash: Fixed a scenario where a semi-random crash would occur for certain users/configurations when either starting d7x or when saving the Config. Since the issue occurred during d7x startup, it was also seen when deploying from the d7x Remote Deployment Tool. Info Report / Product Keys: Fixed an issue which caused an error “system cannot find the path specified” when generating an Info Report, specifically during the “Getting Product Keys” routine. Client ID and Reports Directory: Fixed: Removed a temporary work-around (in place to resolve some FTP upload issues) which was creating these values after filtering out many non-alphanumeric characters, most visibly this replaced spaces with underscores. Lock Screen: Fixed Lock Screen interface not displaying the password prompt when the unlock button was clicked, and also not resizing to cover the entire screen. Config UI: Fixed issue where all hovering the mouse over any checkbox on the “Behavior/Updates” tab always displayed the “Activation Check” details in the lower description pane instead of the details for that specific item. Config UI: Fixed issue where search option on Custom Apps tab sometimes displayed results without the search term. FTP Upload Failure with Integrated Apps: Fixed an issue where uploading from the Integrated Apps tab (under the Config -> Custom Apps tab) would fail to upload files such as dSupportSuiteSetup.zip; also the FTP Upload functionality now accepts .exe as well as .zip files as might be expected. Disable Windows Defender: Restored the functionality to disable Windows Defender (Config > Behavior tab > General Behavior section) which was not working properly depending on the build of Windows 10 and possibly 8.x as well, by implementing some new methodologies to accomplish the task. Offline mode functionality has been removed entirely pending a rewrite, and will be re-introduced in a future update as separated from the current main interface. The visible Offline tab remains in the current build but functions as described below. Offline mode functionality is used in working with OSes on partitions other than the active/system partition, e.g. from ‘Tech Bench’ PCs or WinPE boot disks. Please continue to use d7II.exe for all Offline related functionality. With each new launch/instance of d7x, on every first click of the Offline tab you will be prompted to run d7II instead (from d7x\d7IIv3) which will download as necessary. Please be aware this is a fully pre-populated and configured copy of d7x and is only for NEW configurations of d7x. If you extract this to an existing d7x directory it will overwrite ANY existing configuration, including logo files, with the exception of your product registration and Technician Password. If you wish to start over fresh using this configuration, it is highly recommended to extract this to a NEW directory and when running d7x for the first time, use the Browse button to import your existing Reg.Settings.dat file from an already registered copy of d7II or d7x, which contains your product registration and Technician Password. Always remember: If you run d7II or d7x on any system and do not use “End Session” to close it, running any subsequent d7x version from any other location will in turn launch the d7x .exe that was used to start the session, as well as use it’s configuration instead. Always “End Session” when closing d7II or d7x on any PC you intend to use/configure multiple copies on, prior to launching the d7x .exe in any other location. New: Technician Password correction! When extracting an encrypted config archive, d7x will now prompt if the technician password (used for archive encryption) is incorrect, allowing the option to retry as many times as necessary. Previously when encrypted config extraction failed due to an incorrect password, d7x was launched with blank config triggering a first-time registration prompt on launch. This has actually been an issue since d7 Premium with dCloud, but rarely a problem since typically no one changes that password. By having few options in d7/d7II/d7x that require it’s manual input, this is why it can easily be forgotten and not become an issue for quite some time. It usually takes a new major release (d7II, and now d7x) when those opting for the “clean download/setup” can bring this on with new configs created using different technician passwords entered during the initial registration process. New: d7xRDT v18.3.17.1 and above will self-update it’s own binary when deployed, to ensure server connectivity with updates as changes are required. Fixed: Failure to run scripts within custom app configurations that used the %scriptdir% variable to point outside of the 3rd Party Tools directory. Possibly other cases were an issue resulting from the bug. Further, some custom apps were failing without a download URL being configured. Fixed: d7x sometimes failed to restart itself along with Windows. Previous versions ran shutdown code which removed the startup entry responsible for launching d7x after a Windows restart; this also stalled auto mode operation until d7x was manually launched again. Fixed: Issues and failures related to reboot options to put Windows in Safe Mode, including a failure with the custom internal functionality “Safe Mode w/Networking Mod” which is now working properly. Fixed web links opening in the d7x internal browser despite being configured to use the system default web browser. Fixed: Starting with d7x v18.3.16.0 and d7xRDT v18.3.17.1 self-updating is once again functional. All previous versions will fail to establish secure communications with our servers after Feb. 26th, 2018. Fixed: The existing setting in Config > Personalize to “Display d7x Path in Title Bar” is now working again. Fixed: “Full Auto Mode” may repeatedly reload default settings for the “Audit” tab if d7x or Windows restarts for any reason, and the mode has already progressed to another tabs; the effect would be that the checked items will run all over again. Fixed: Zip reports for upload to FTP server (most notably used with PC Repair Tracker integration) may fail depending on your configuration. The issue is resolved in our testing; please report any further issues. Change: Various d7II-specific code has been replaced with d7x-based replacement code. Affected areas include manipulation of user profile directories by various procedures, loading/saving file data, loading/saving of (d7II compatible) d7x configuration settings, and more. Benefits include stability with improved error handling, and speed with fewer disk read and especially disk write operations. Change: d7II v3.x files (when downloaded automatically) are now saved to the d7x\d7IIv3 subdir; the d7x\Config dir is also automatically copied there to separate config settings as d7x transitions to using newer features and settings not compatible with d7II. We would prefer you to copy your d7x\Config dir to the d7x\d7IIv3 dir after settings changes in d7x (and also copy the d7x\Modules to d7x\d7IIv3 if definitions files are altered through d7x.) See the “d7II v3.6.87 Update Information” section above for more details. Change: The “Start Session” config option “Automatically generate System Info Report” now checks Windows Activation for the report, even when Windows activation checks on Vista and above are disabled (also changed to become the new default) when loading the System Info tab. Change: Moving reports to a UNC path (via End Session tab/config) and emailing the reports are affected by new code replacements, which is in preparation for modifications and new functionality. Fixed: Audit and Tweaks Auto Mode were previously bugged and never triggered the flag to signal that they had completed all tasks. As a result, changing the Auto Mode profiles (top right selection box) would fail with a user prompt explaining to stop the current task before switching modes. Fixed: KillEmAll (v5 internal) had improved kill routines that were terminating critical Windows 10 processes (one in particular caused UI issues in d7x, Windows itself, and other apps) therefore internal logic was improved/added for additional Windows 10 processes. Fixed: Windows activation checks on Vista and above were occurring more than necessary; this is an issue on Vista and above because it is a slow process and causes the d7x UI to hang while it is running. Fixed: Some web links initiated from d7x may prompt you twice before opening the link. 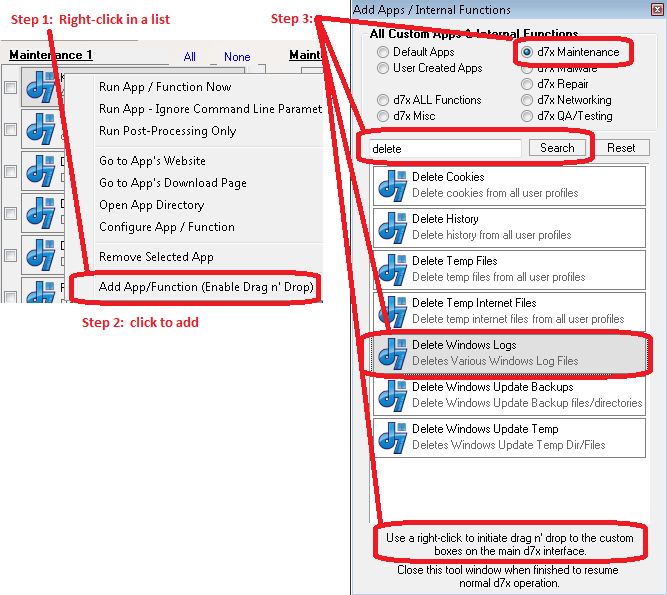 Fixed: Fab’s AutoBackup not launching AutoBackup6ProTrial.exe after download. Improved detection of existing AutoBackup[x]Pro.exe files. Fixed: Issue: (Manual Resolution Available) Fab’s AutoBackup button continues to launch the extract utility if any AutoBackup[x]ProTrial.exe files are found in a \3rd Party Tools subdir from previous d7II/d7x v17.x usage. A fix is planned, but deleting the file will resolve the problem entirely, as well as enable the new Fab’s AutoBackup fixes to former functionality and new behaviors. The issue is now resolved. Fixed: When a system was configured to use more than two DNS servers, the display on the System Info tab was not truncating the display info. Remaining Issue: Unfortunately the hover tooltip and lower status display is not displaying the full list of DNS servers. Fixed: Session start tasks were not running when launched from d7xRDT (Remote Deployment Tool) as configured, including asking for client name/ticket number, installing context menus for explorer, creating the desktop icon, correcting time zone, etc. Fixed: End Session tab settings not loading from the d7x safe mode UI, as well as (re)loading on the normal UI every time the tab is switched back to End Session, and reloading again when actually ending session if triggered from the top right red X button, but after the button is pressed, negating any manual/temporary config change you may have made on that tab previously. Fixed-ish: Custom Apps and other integrated apps (e.g. Fab’s AutoBackup) stored on Self-Hosted FTP servers fail to download if located in the root FTP path (e.g. “/CustomApp.zip”) and not a subdir. UPDATE: See the first item in KNOWN ISSUES for a resolution. None are known at this time. Update Failure: d7x v18.7.4.x may not update due to an authentication failure, but regardless it will attempt to do so upon seeing a required update. To resolve, simply replace the main exe with the current one which can be downloaded in the d7x Manual at the top of the page. Update Failure: d7x v18.2.3.0 [TestBuild] and all previous versions will no longer self-update or recognize update availability. The issue also causes failure when launching any d7xRDT packages created with this and previous versions of d7x. See this post for details. Issue: Several child windows in d7x (e.g. the internal KillEmAll) may fail to display your customized icon in the top left corner (meaning the 16×16 pixel ICO, not the larger BMP logos…) even though it appears in the main and most other d7x windows. Issue: d7x lower status bar may report “Idle…” when busy (or an idle/display message) during an Auto Mode. Specifically, Malware Auto Mode configurations using KillEmAll settings/options at the top can trigger this behavior, though it may also be caused by various other reasons in any Auto Mode. Subsequently, clicking anywhere within a d7x based user interface will trigger the “Not Responding…” Windows message. In this case, d7x isn’t updating the user interface appropriately, which causes both the status bar “Idle…” message as well as the Windows/app unresponsive behavior when the user initiates any type of interaction with one of d7x’s windows. New ‘Config Mgmt Portal‘ (first item under the ‘Server’ menu) combines the separate dCloud/Self-Hosted FTP portals from d7II, and rewrites all server communication functionality with regard to config sets and definitions. d7x v18.3.16.0 and above add user prompts if the technician password (used for archive encryption) is incorrect, allowing the option to retry as many times as necessary before failing. New password prompt option during initial extraction prevents unauthorized usage of the Remote Deployment Tool without requiring password protected startup on the d7x .exe itself. Using elastic IPs in place of hostnames to resolve dCloud connectivity issues in situations where a particular ISP creates an issue with DNS or hostname based filtering. Capable of connecting to a d7x based “dCloud” server (not yet implemented) which uses SSL communications and can use HTTPS for login and uploading, allowing full dCloud communication, while bypassing any network restrictions on FTP protocols even over SSL channels. New in v18.3.x.x: Technician Password correction! When extracting an encrypted config archive, d7x will now prompt if the technician password (used for archive encryption) is incorrect, allowing the option to retry as many times as necessary. Note d7xRDT only works with d7x and is not actually able to download d7II.exe, so it cannot serve as a replacement for the current d7II SFX Mini to deploy d7II remotely. Config/definition storage and sync (dCloud/Self-Hosted FTP) functionality has been replaced entirely with new d7x code, and include a few minor new additions to the user experience, as evidenced by the optional startup prompt shown here. This d7II feature is used to merge definitions when starting a new session, and in d7x it was expanded to offer a download only option, and a description of what the “merge” actually does. When a config on the server is newer, this is also be an option within the same user prompt. 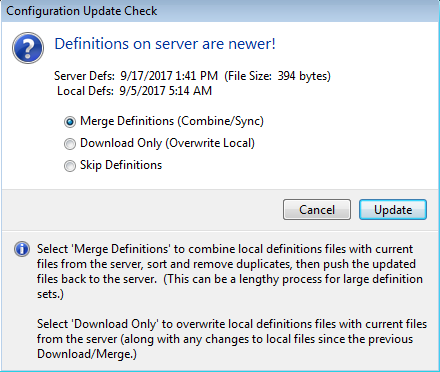 Note: The data crunching part of the definitions “merge” is still handled by d7II code (in fact via the dFunk.exe module) as before, but d7II.exe’s involvement in determining updates, retrieving the current defs, and putting updates back on the server was replaced entirely with new d7x code. Fixed: improved kill routines were terminating critical Windows 10 processes (one in particular caused UI issues in d7x, Windows itself, and other apps) therefore internal logic was improved/added for additional Windows 10 processes. New: should correctly save logs to the d7II Reports directory. This may does not yet include automated saving of file details when viewed through the file inspection window. Previous d7II/KillEmAll options for ‘Google’ web searches, VirusTotal uploads, file deletions/renames, etc. etc. are not yet available through the interface or the through the file inspection window. The previous ‘Suspicious Files’ search is also not available, but a more complete implementation (file system scan only) is found in d7II’s dFunk module used for manual inspection of the file system and registry. The previous version of KillEmAll with most of these missing features is still automatically downloaded as a separate exe along with other d7II modules, but the separate exe is and has always been a slightly older implementation of the internal version used in the last version of d7II, and will miss any included automatic reporting features through d7II. Added: Support for Windows 10 (minor differences from Windows 8.x) in “Restore Default Start Menu LNKs” repair functionality. Added: Windows 10 to custom app platform/OS restriction settings. If not configured, behavior should not change. Backwards compatibility note: This is the only area in d7x configurations where d7II may (and likely will) erase the setting entirely when used to edit the same custom app configuration. Removed: “Automatic Updates are Disabled” check from startup alerts on Windows 10, since the update setting (and it’s associated Windows user dialog) no longer exist in Windows 10. UTC Adjustment settings no longer necessary; removed from Config > Regional Settings (on first tab.) These were previously used in converting various dates from UTC, such as Windows event log entries when viewed through the internal d7x Event Viewer. Automated time zone changes now function properly with ALL Windows versions when configured; setting in Config > Regional Settings (on first tab.) Previously automation was unsupported only on Windows Vista. Fixed a minor issue where system restore points created from the “Windows” drop down menu were created using a generic name, not the one you typed in the prompt. Fixed dUninstaller bug: failure to apply the proper silent uninstall switches when processing installers created by Inno Setup. Fixed DataGrab bug: failed to create a registry export of ODBC settings from an offline OS/partition in some circumstances. d7II.exe has been updated to v3.6.87 (version increment only) to satisfy future notification prompts, and made available for use as a backup in the event of d7x failure. This should be done automatically when updating to d7x from d7II.exe, but if you aren’t updating from d7II you can always download this via the prompt using the d7x “Main” menu > “Check for Updates” option, or use this link. UPDATE: Some users have reported d7II.exe as zero byte after an update to d7x is initiated from within d7II; in this event, please delete the zero byte file and then re-download d7II.exe via the method above. We now prefer d7II to reside in a .\d7IIv3 subdirectory from the main d7x folder (wherever your d7x vx.x.x.x.exe resides.) Prior to the first time usage of d7II.exe, the .\Config directory should be copied into .\d7IIv3 directory, and if configuration changes were made through d7x that would affect d7II operation, the same should be done when starting a new session from d7II. Copying the .\Config directory should not be necessary if it was done at least once at any point in time (unless d7x registration/account changes were made), or if you are resuming a previous session started by d7x.